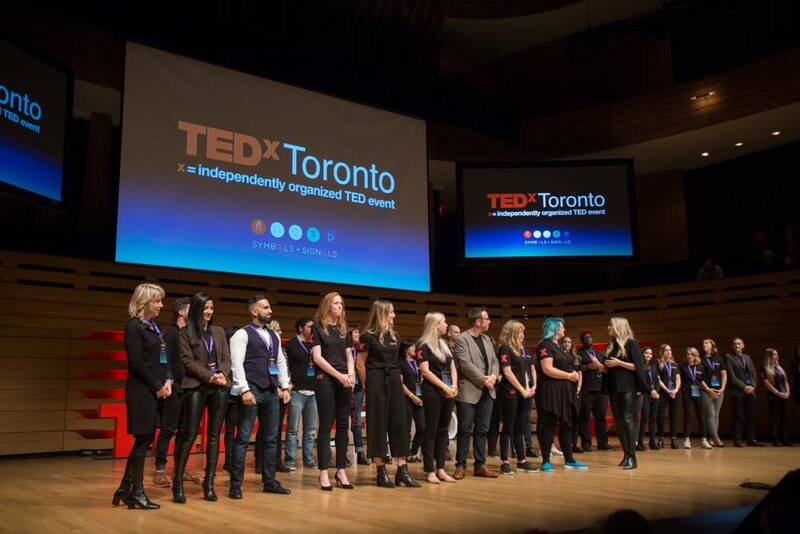 I had the honour of attending TEDxToronto 2016 and seeing 16 remarkable Canadians present solutions to some of the most difficult issues challenging our world today. 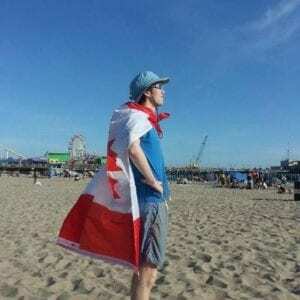 What was my take away other than drinking super-sized mugs of Canadian awesomeness all day? Gratitude for Canada's diversity, our healthcare system, our accessible education system, our thriving tech community. These five talks in particular gave me hope for the future. When Calvin spoke at TEDxToronto 2016 he was a student at University of Toronto studying Mechanical Engineering. University of Toronto student Calvin Rieder is determined to increase access to clean water where it's acutely needed. Calvin began working on solutions to solve the water crisis all though his junior and high school years in Oakville, Ontario. He succeeded in creating the first portable device that pulls clean, drinkable water out of thin air without using external energy. Calvin's been featured in the Toronto Star, won numerous awards for his water innovations including the Top 20 Under 20 from Plan International. He even had an asteroid named for him! As a member of the World Youth Parliament for Water, Calvin helps to raise awareness and promote universal access to water and sanitation. As as Mechanical Engineering at the University of Toronto, Calvin is also working on a second project calls a solar still that purifies water through distillation. While volunteering in post-earthquake Haiti, Dr. Sonny Kohli had a front line view of the perils of inadequate health care faced by marginalized communities. In addition to medical training, Dr. Kohli had studied to be an astronaut. He began to look for space age solutions for medicine. His company Cloud Dx is developing products that are revolutionizing the way healthcare is provided. 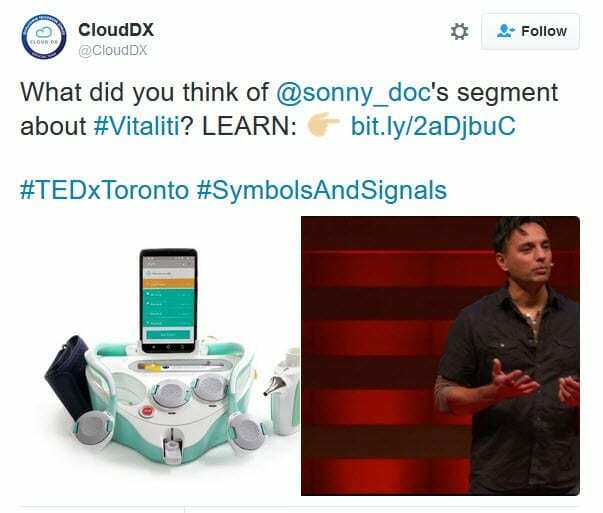 Dr. Kohli demonstrated an app called Vitaliti which is a fully autonomous “digital doctor”. You simply cough into your phone and it tells you any one of 10 ailments you may have or if you're healthy. The tools his company is creating will reduce healthcare costs, give more people access to healthcare and make it easier for doctors to provide medical support in a disaster zone. 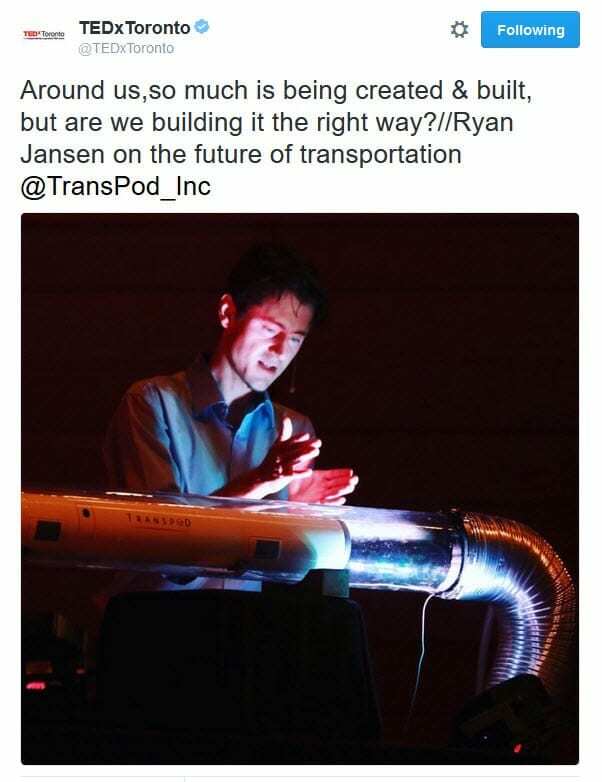 Ryan's company Transpod is building the “5th mode of transport” — a high speed ground transportation that offers an unprecedented solution that could revolutionize airline, train and highway travel. Hyperloop is a tube that contains a vehicle that's a cross between a subway and airplane and can travel 1000km/hour. You could go to Montreal in 30 minutes. The plan is to have a working model in three years. Hyperloop eliminates the huge jet fuel requirements and carbon emissions of jet travel. It's is powered by renewable energies including self-sustainable solar power with no carbon footprint. Just think of what this will mean for commuters, urban planning and the planet! Andray is a writer, community activist and co-founder of TXDL, an educational program which teaches tech skills to diverse youth. Born and raised in Toronto, Andray is a critical observer of the way race is lived in Canada, and was named one of the Globe and Mail’s “16 Torontonians to Watch in 2016”. Andrea observed that less than 5% of gaming characters are non-white. What's worse, non-white characters are mostly negative and rarely portrayed as heroes. This is not only racist but it's bad business. Andray is working on reversing the mental impact of systemic racism by creating games with diverse heroes. 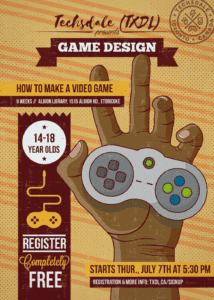 He's co-founder and Executive Director of the Techsdale TXDL program in Rexdale, Ontario which teaches game design to high school students. Andray Domise is co-founder of TXDL, an educational program that teaches tech skills to diverse youth. Neil Pasricha (@NeilPasricha), Mr. 1000-awesome-things himself, stepped onto the the stage and turned the spotlight on the audience. The time had come for us to answer the big questions. Neil is one of the most successful TED speakers of all time. Nearly 3M people have watched his TED talk, The 3 A's of Awesome. 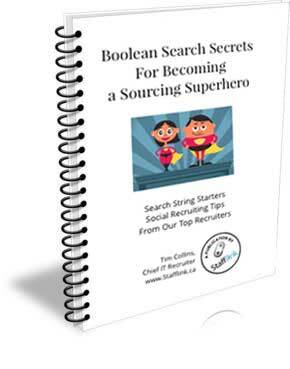 You may know him from his best sellers, The Book Of Awesome and The Happiness Equation. His talk at TEDxToronto 2016 was passionate, thought provoking and introspective. As Neil drilled us with questions, the audience rode a roller coaster from confusion, to anger, to standing ovation. His questions webbed together and made me think about our purpose as humans and the legacy we want to leave to the next generation. Inspired, ignited and proud to be Canadian! 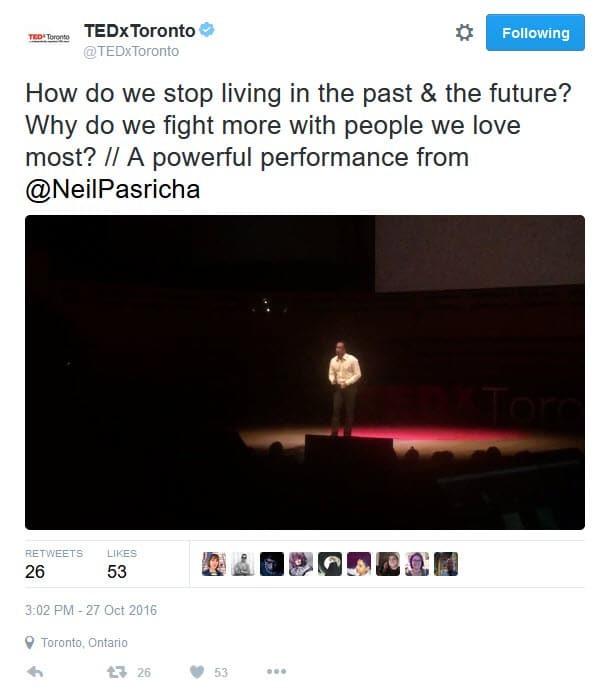 Neal Pasricha reminds us that we can't just sit around waiting for heroes to solve our problems. We're all called to choose an issue that speaks to our heart and make a contribution. I worry about youth unemployment. Is our education system adequately preparing young people for the jobs that need to be filled when they graduate? What can I do about it? 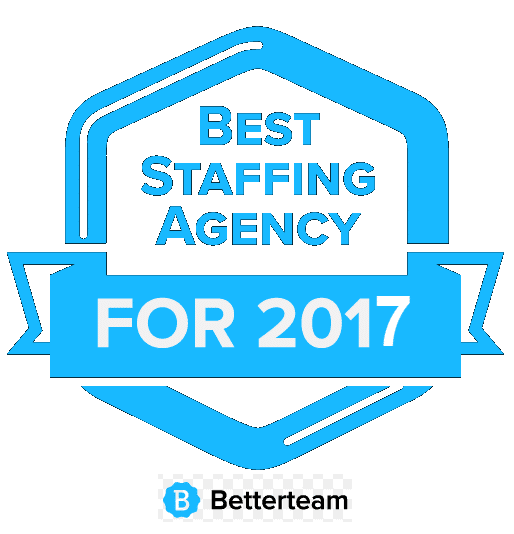 For a start, I can speak to students and tell them about the fun, creative and good paying jobs that are available to them in the tech industry. What's a problem that keeps you up at night? What's one small step you can take towards solving that problem? If you enjoyed this post, sign up to receive an email update when we publish something new.